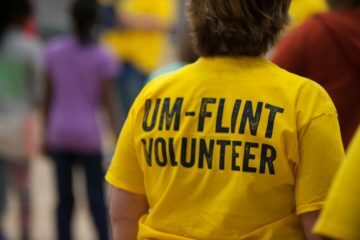 A member of the campus community volunteering at a UM-Flint event. 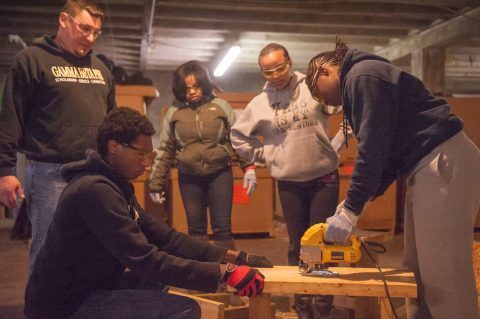 Since early fall, a group of University of Michigan-Flint campus stakeholders have been working to finalize plans for the campus’s upcoming annual MLK Day of Service on Monday, January 21. 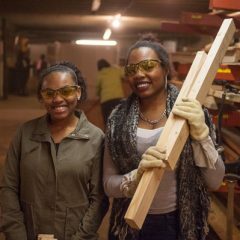 Following a multiyear tradition of honoring the legacy of Dr. Martin Luther King Jr. through community service, the MLK planning committee has developed a variety of rewarding service opportunities and associated activities for the entire campus to participate in. 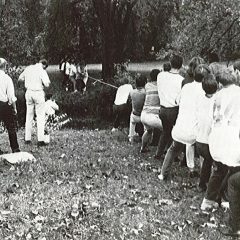 “Although I have been part of this campus community for less than a year, it has been made clear to me that MLK day is not just an annual effort to honor Dr. King’s legacy through service but also a strong reflection of what our campus aspires to do year-round in our community,” said David Luke, director of UM-Flint’s Intercultural Center and MLK planning committee member. With about a week left to register, the committee is encouraging the campus community to register to volunteer at one of 10 community service sites online. Despite having become a tradition at UM-Flint, this effort has not had permanent funding until this year. Chancellor Susan E. Borrego moved to allocate permanent funding to the annual MLK Day of Service to assure it continues without a hitch well into the future. As in past years, the day of service will kick off with a volunteer keynote breakfast open to the entire campus. This year’s keynote speaker is social justice advocate and community leader Siwatu-Salama Ra. In addition to the breakfast and off-campus community service opportunities, students, faculty and staff can also participate in a campus blood drive hosted by Michigan Blood from 9 a.m. to 3 p.m. in the Happenings Room of the University Center.